Purpose Surgical correction of esotropia in patients of neuronopathic Gaucher’s disease (GD) type 3 aiming to improve the cosmetic appearance with the evaluation of the success rate, presence of residual angle, or recurrence during the follow-up period. Study design A retrospective, descriptive study. Patients and methods Ten patients with type 3 neuronopathic GD were referred from the Pediatric Gastroenterology and Neurology Units of Mansoura Children’s Hospital. All patients suffered from systemic, neurological, and ophthalmological manifestations such as hepatosplenomegaly, horizontal gaze palsy and esotropia, respectively. They received enzyme replacement therapy, and showed a stationary course for at least 1 year before strabismus surgery. Patients were admitted and operated for cosmetic correction of esotropia. They were followed up regularly every month for 1 year. Postoperative data were recorded at the end of 1, 3, 6, and 12 months. Results In all, 80% of cases showed improvement of the angle. Orthotropia (within 10 pd) was obtained at the end of 6 months and maintained till the end of 1 year postoperatively; 20% of the cases showed residual esotropia. Conclusion Surgical correction of strabismus in type 3 GD can achieve good cosmetic results with low risk of residual angle or recurrence. Gaucher’s disease (GD) is an autosomal recessive lysosomal storage disorder; it is caused by a hereditary deficiency of glucocerebrosidase enzyme. Deficiency of this enzyme results in the deposition of fatty substances known as sphingolipids (glucocerebrosides) in the reticuloendothelial cells of certain organs. The liver, spleen, long bones, and central nervous system are the primary organs to be affected . Three phenotypes are recognized: type 1 (GD1), the non-neuronopathic type which is the most common form (94% of cases). Type 2 (GD2), the acute, rapidly fatal type which represents 1% of cases, and type 3 (GD3), the neuronopathic or chronic type which represents 5% of cases ,. The earliest neurological defect in GD3 is horizontal saccadic movement initiation failure (SIF), which is pathognomonic for this type of disease. Other ocular motor abnormalities include strabismus, nystagmus, and an abnormal vestibulo-ocular reflex. Strabismus (mostly esotropia) is present in 22% of cases ,,. Most of the studies neglect the surgical management of this type of strabismus for the fear of progression of the disease and recurrence of strabismus.This study was performed to correct esotropia in patients with GD3 surgically, aiming to improve the cosmetic appearance of those patients, and for the evaluation of the success, residual, or recurrence of strabismus during the follow-up period. This study was carried out in the period from February 2014 to July 2016. GD3 were seen in 45 patients, who were referred from the gastroenterology Unit of Children’s Hospital to the Mansoura Ophthalmic Center for ophthalmological assessment. Ophthalmologically, all patients had SIF, 10 of them had strabismus (esotropia). So, they were our study group, and the surgery was performed for those 10 patients aiming to correct their cosmetic appearance. Informed consents were obtained from parents of those 10 patients before the surgery, and the protocol of the study was approved by the Ethics Committee of Institutional Review Board and was adhered to the Declaration of Helsinki (IRB: R/16.05.104.). All 10 patients enrolled in this study were suffering from hepatosplenomegaly, SIF, and esotropia. Other systemic, neurological manifestations and angle of esotropia are shown in [Table 1]. They received enzyme replacement therapy (ERT), with a stationary course of the disease for at least 1 year before strabismus surgery. They were followed up regularly every 2 weeks in the Gastroenterology and Pediatric Neurology Units of Children’s Hospital. The enrolled 10 patients were followed regularly in the strabismus clinic every 3 months for 1 year before the surgery, to ensure the stationary course of their strabismus. A complete ophthalmological examination was done, which included aided and unaided visual acuity measurements in cooperative patients. Cycloplegic refraction, anterior segment examination, and dilated fundus examination were done for all cases. Strabismological examination showed that all cases had horizontal gaze palsy with preserved vertical gaze movement. All cases had esotropia in primary position, two cases had severe horizontal gaze palsy (fixed esotropia), and eight patients had moderate form, as shown in [Table 1] and [Figure 1] and [Figure 2]. 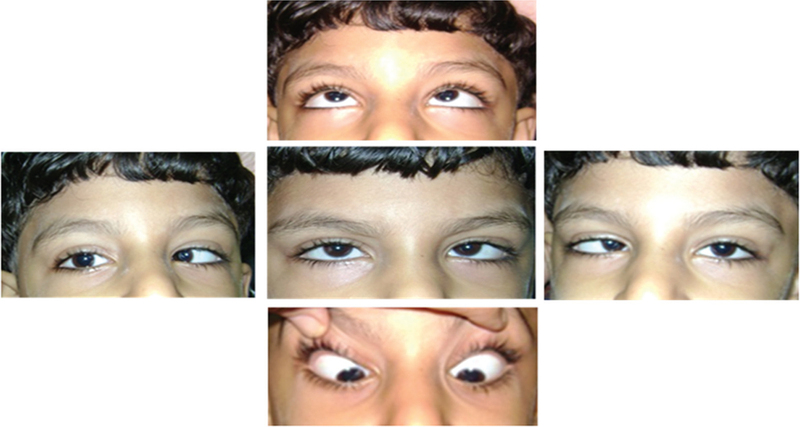 Figure 1 Patient of Gaucher’s disease type III (12 years old); he has esotropia associated with severe horizontal gaze palsy (fixed esotropia) and preserved vertical gaze movement. Figure 2 Patient of Gaucher’s disease type III (7 years old); he has esotropia associated with moderate horizontal gaze palsy and preserved vertical gaze movement. The angle of esotropia (objective angle) was measured by synoptophore, as there was difficulty in using prism bar and cover test, and also there was difficulty in the measurement of subjective angle, as some cases were mentally retarded. All patients underwent strabismus surgery aiming for the correction of esotropia by performing bi-medial rectus muscle recession (ranging between 4 and 6.5 mm from the insertion site of the muscle). Forced duction test was performed for medial rectus muscles before starting the surgery and it was negative in all cases. The operation was performed through a limbal-based incision; medial rectus muscle was isolated and sutured by absorbable 6-0 polyglactin 910 suture (Vicryl; Ethicon, Somerville, New Jersey, USA). The muscle was cut and recessed from the insertion site to be sutured into the sclera at the new measured insertion site. Then the conjunctiva was restored anatomically. Postoperatively, the patients were followed regularly every month for 1 year postoperatively. The patients were followed up regularly every 2 weeks at the Gastroenterology and Pediatric Neurology units for their regular treatment and follow-up. Postoperative data were recorded by the end of 1, 3, 6, and 12 months. Of the patients four were women and six were men with an age ranged between 6 and 12 years. No intraoperative complications were encountered except for more bleeding during the isolation of medial rectus muscles that was controlled by simple compression. Postoperative follow-up showed delayed wound healing and delayed resorption of the subconjunctival hemorrhage of up to 2 months in all cases. SIF was persistent postoperatively in all cases. Success was defined as alignment within 10 pd of orthotropia at the end of the follow-up period (1 year). Orthotropia was obtained in eight cases, while residual esotropia (25 and 35 pd) was present in two cases. There were no cases with overcorrection. [Table 2] shows the demographic data and ophthalmological findings of all cases. Residual esotropia was observed in two cases (patients 4 and 9 in [Table 1]) with severe limitation of ocular motility (fixed esotropia). 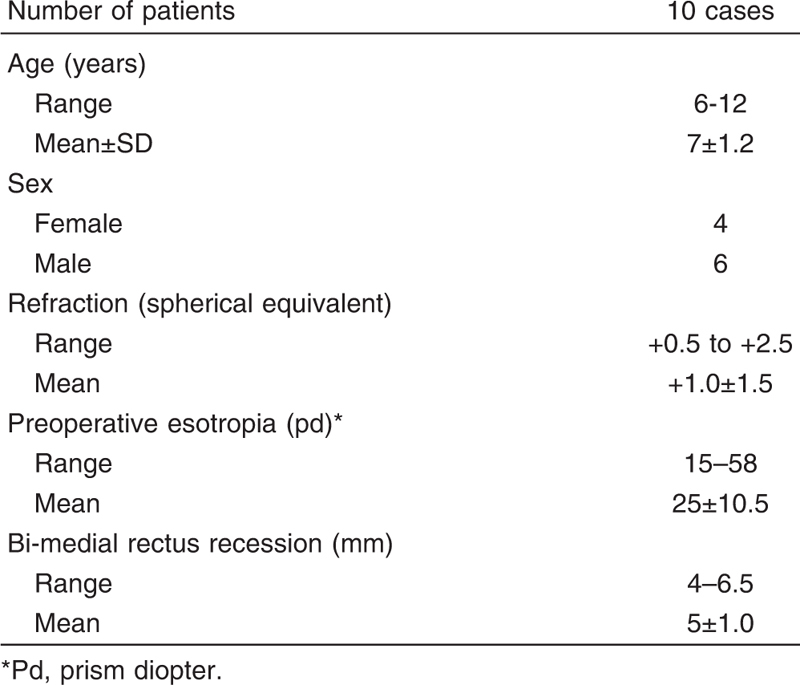 The preoperative angle of esotropia was large in those patients (58 and 56 pd, respectively), with severe systemic and neurological affections) ([Table 1] and [Table 3]). Eight patients showed corrected esotropia. Description of criteria of orthotropic and residual esotropic patients is shown in [Table 3]. The improvement was gradual during the first 6 months and was established as orthotropia (≤10 pd) by the end of 6 months. Orthotropia remained stationary by the end of 12 months follow-up ([Figure 3]). Figure 3 The same patient of [Figure 2], postoperatively with gradual improvements of the angle through the follow-up period: (a) 1 month postoperatively, (b); 3 months postoperatively, (c) 6 months postoperatively, (d) 1 year postoperatively. GD3 is usually present throughout the first decade of life, with an average survival till the fourth or fifth decade ,,. Throughout their life, they suffer from many systemic, neurological, cosmetic, social, and emotional insults. Many studies addressed that improving the quality of life of those patients could be achieved with proper management of the disease ,. Surgical management of patients with GD3 may be considered in certain situations such as splenectomy, joint replacement, and strabismus surgery. The surgical interference for those patients may improve their quality of life ,. Strabismus is present in 22% of cases that represents a cosmetic problem. While the hallmark neurological abnormality of this disease is a saccade initiation failure ,. Specific therapy is known as ERT, which improves the systemic manifestations. However, this therapy just stabilizes the neurologic manifestations and prevents the progression of the disease ,. Patients enrolled in this study received ERT and their systemic, neurological, and ophthalmological manifestations were stationary for 1 year before the strabismus surgery. The surgery aimed to correct the esotropia cosmetically. We noticed that there was delayed wound healing, prolonged subconjunctival hemorrhages, and gradual improvement of the angle during the postoperative follow-up period. These findings were reported to be due to bleeding tendency and delayed healing of tissues in such patients ,. In this study, the cosmetic acceptability and success rate were 80%, while 20% showed residual esotropia through 12 months of follow-up. 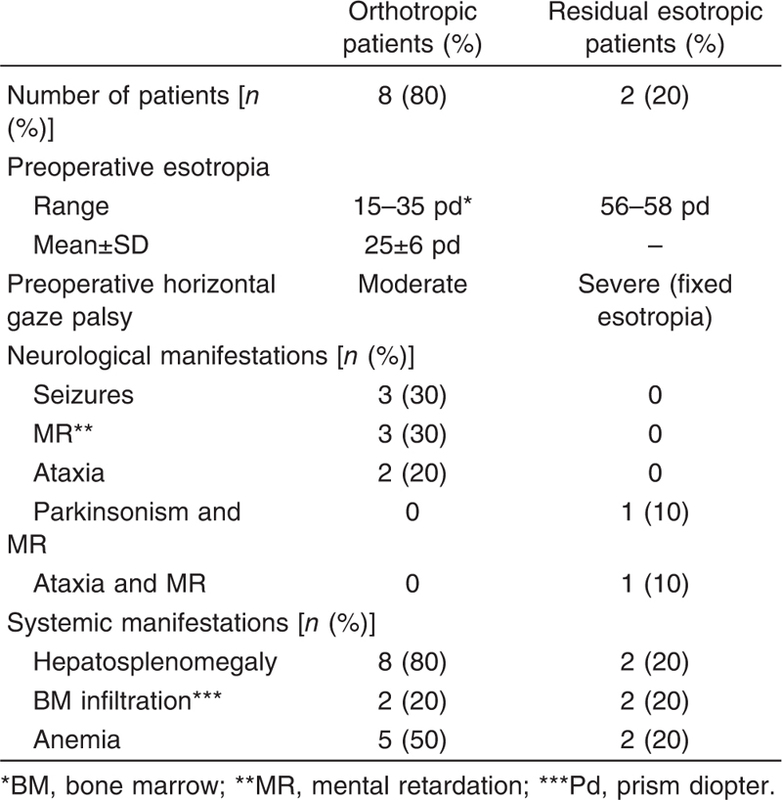 The residual esotropia was found in those patients with severe neurological and systemic involvement, with also preoperative severe horizontal gaze palsy and fixed esotropia ([Table 3]). Meanwhile, the success was observed in those of moderate horizontal gaze palsy, and less severe systemic and neurological manifestations (as shown in [Table 3]). We have no obvious explanation for postoperative gradual improvement of the angle within the follow-up period; it may be due to delayed medial rectus muscle healing, as those patients suffer generally from delayed wound healing; or maybe possible complete ophthalmoplegia that developed and corrected the initial undercorrection. However, to our knowledge, the surgical correction of strabismus in patients of GD3 to improve the cosmetic appearance, as part of their social and emotional aspects of quality of life is not investigated. So, more studies are required to validate strabismus surgery, with a larger number of patients and longer follow-up periods to monitor the long-term success of strabismus surgery in such patients. Ophthalmological counseling may help patients of GD3 to manage the difficulties of their disease, and contribute to solving the cosmetic insult. Strabismus surgery can achieve a good cosmetic outcome with low risk of recurrence of strabismus, provided that a stationary course of the disease, mild horizontal gaze palsy, with less neurological affection. Hoffmann B, Mayatepek E. Neurological manifestations in lysosomal storage disorders − from pathology to first therapeutic possibilities. Neuropediatrics 2005; 36:285–289. Patterson MC, Horowitz M, Abel RB, Currie JN, Yu KT, Kaneski C et al. Isolated horizontal supranuclear gaze palsy as a marker of severe systemic involvement in Gaucher’s disease. Neurology 1993; 43:1993–1997. Charrow J, Andersson HC, Kaplan P, Kolodny EH, Mistry P, Pastores G et al. The Gaucher registry: demographics and disease characteristics of 1698 patients with Gaucher disease. Arch Intern Med 2000; 160:2835–2843. Accardo A, Bembi B, Pensiero S, Perissutti P. Type 3 Gaucher’s disease in a three-year-old child: saccadic eye movements analysis. J AAPOS 2005; 9:501–503. Harris CM, Taylor DS, Vellodi A. Ocular motor abnormalities in Gaucher disease. Neuropediatrics 1999; 30:289–293. Harris CM, Shakat K, Russell-Eggitt I, Wilson J, Tylor D. Intermittent horizontal saccade failure(oculomotor apraxia) in children. Br J Ophthalmol 1996; 80:151–158. Burrow TA, Barnes S, Grabowski GA. Prevalence and management of Gaucher disease. Pediatric Health Med Ther Dovepress 2011 2:59–73. Beutler E, Nguyen NJ, Henneberger MW, Smolec JM, McPherson RA, West C et al. Gaucher disease: gene frequencies in Ashkenazi Jewish population. Am J Hum Genet 1993; 52:85–88. Filocamo M, Grossi S, Stroppiano M, Tortori-Donati P, Regis S, Allegri A et al. Homozygosity for a non-pseudogene complex glucocerebrosidase allele as a cause of an atypical neuronopathic form of Gaucher disease. Am J Med Genet A 2005; 134A:95–96. Hayes RP, Grinzaid KA, Duffey EB, Elsas LJ. The impact of Gaucher Disease and its treatment on quality of life. Qua Life Res 1998; 7:521–534. Goker-Alpan O. Therapeutic approaches to bone pathology in Gaucher disease: past, present and future. Mol Genet Metab 2011; 104:438–447. Schiffmann R, Fitzgibbon EJ, Harris C, DeVile C, Davies EH, Abel L et al. Randomized, controlled trial of miglustat in Gaucher’s disease type 3. Ann Neurol 2008; 64:514–522. Vellodi A, Bembi B, de Villemeur TB, Collin-Histed T, Erikson A, Mengel E et al. Management of neuronopathic Gaucher disease: an European consensus. J Inherit Metab Dis 2001; 24:319–327. Davies EH, Erikson A, Collin-Histed T, Mengel E, Tylki-Szymanska A, Vellodi A. Outcome of type III Gaucher disease on enzyme replacement therapy: review of 55 cases. J Inherit Metab Dis 2007; 30:935–942. Nagral A. Gaucher disease. J Clin Exp Hepatol 2014; 4:37–50.